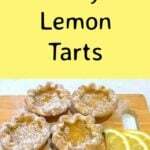 Easy Lemon Tarts. These are ‘awesome’ as Adelenne says! 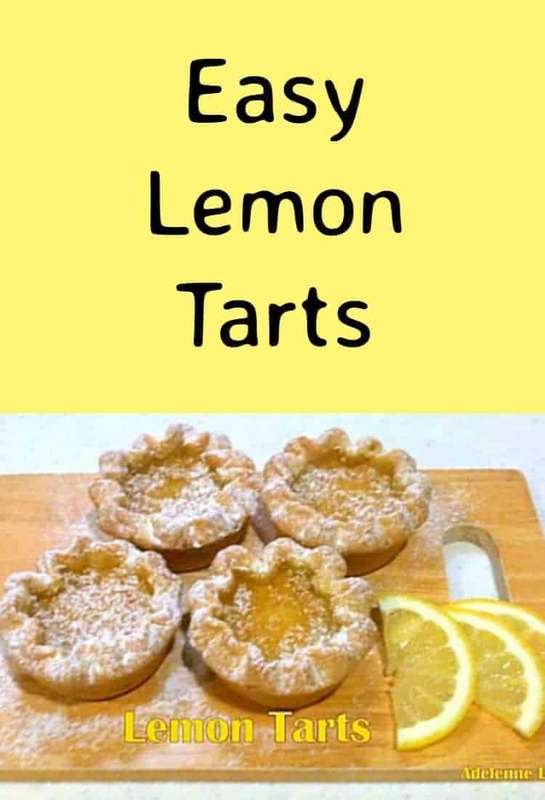 Here she has made up a simple shortcrust pastry and used lemon curd to bake these delights. They sure are delicious so let’s see how Adelenne makes these tarts. Makes 2 batches, roughly 6 tarts per batch. 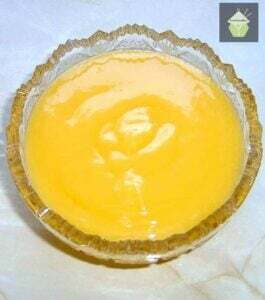 Allow 1 1/2 Tablespoons Lemon Curd per tart. If you would like to make your own Lemon Curd, click the photo opposite for the recipe. Add butter, pulse until mixture resembles coarse crumbs. 2. Slowly add 1/4 cup ice water. Pulse till dough is crumbly but holds together when squeezed. Do not overmix to have a flaky crust. You should see some pieces of butter still. 3. Divide dough into two portions, with dough still crumbly, wrap with 2 pieces of cling wrap to form 2 balls. Wrap tight, refrigerate till firm. 2. Grease the muffin pan. 3. Roll out the pastry to approx less than 1/4 inch thick, cut discs out to fit the muffin pan. Adelenne used a rice bowl as a cutter, use whatever you have that fits! 4. Place each disc in the muffin holes crimp the edges of the pastry and put about 1 1/2 Tablespoons of lemon curd in each. 5. Bake in the oven for about 30 minutes, until the pastry is crisp and golden. 6. Allow to cool and sprinkle some powdered sugar over the tops and enjoy! Slowly add 1/4 cup ice water. Pulse till dough is crumbly but holds together when squeezed. Divide dough into two portions, with dough still crumbly, wrap with 2 pieces of cling wrap to form 2 balls. Wrap tight, refrigerate till firm. Preheat oven to 180C / 350 F / Gas 4. Grease the muffin pan. Roll out the pastry to approx less than 1/4 inch thick, cut discs out to fit the muffin pan. Adelenne used a rice bowl as a cutter, use whatever you have that fits! Place each disc in the muffin holes crimp the edges of the pastry and put about 1 1/2 Tablespoons of lemon curd in each. Bake in the oven for about 30 minutes, until the pastry is crisp and golden. Allow to cool and sprinkle some powdered sugar over the tops and enjoy! Yummy!! I will try this very soon! !